Bí Ẩn Về Tiền Kiếp Hậu Kiếp. Chết và Tái Sinh . Hành tŕnh tới các cơi bên kia cái chết. Khi chết không mang theo được gì. Sống, Chết & sau khi Chết. Thuyết Luân Hồi và Phật Giáo Tây Phương. Ai được quyền bảo người khác chết?. Bộ phim: Trợ niệm và chuẩn bị khi lâm chung. Chết là thời điểm của chân lư. Chuẩn bị cho cái chết . Cơi âm có hay không ? Phát tang, để tang và xả tang. Tôi di dự lễ bỏ mả. Cloning con người, bước chẳng đặng đừng. Phân tích cấu trúc di truyền DNA . Tạo sinh vô tính và vấn đề sinh đạo đức. Tính Luân Lư Của Việc Tạo Sinh. Một biến chứng của nhân loại. Triển vọng về sự phát triển của Đạo Phật trên thế giới vào tk 21. Vũ trụ và con người trở lại vấn đề tạo sinh vô tính. Henry Ford và chiếc xe làm thay đổi thế giới. Hàng không có c̣n là phương tiện an toàn nhất? Ethan Bortnick takes a bow following a recent recital at an art gallery in Florida. Miami Herald/Peter Andrew Bosch His feet can't reach the pedals. And his little fingers sometimes have trouble getting to the proper keys. But if you close your eyes, you'd never know it. 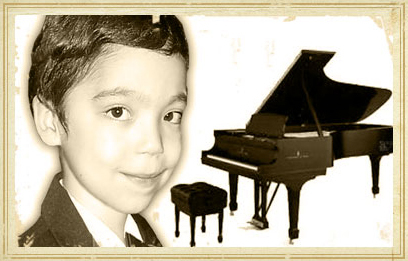 Six-year-old Ethan Bortnick is a classical pianist. Already, he fetches $400 for a 15-minute performance and is recording his own CD. The boy's teacher, Dr. Irena Kofman, is wowed by his astonishing memory. She says he can play more than 200 compositions, from Beethoven's "Fur Elise" to Disney's "It's a Small World," all without sheet music. The Hollywood, Fla., kindergartner is more modest: "I just like playing piano," he says while watching "Dora the Explorer" on a rainy afternoon. "It's not that hard." Lately, Ethan's life has been a little crazy. The video archive on his Web site (www.ethansmelodies.com) has him hopscotching from the Dade Fair to the Palm Beach Ritz-Carlton. His dad, Gene Bortnick, has scheduled him to perform earlier this month at a Las Vegas charity event hosted by Jason Alexander of "Seinfeld" fame. Bortnick has also been talking with producers at "The Tonight Show" and "The Martha Stewart Show" about future appearances, representatives of the shows confirmed. The proud father insists he guards against crossing the line into overbearing stage parent. "We don't push Ethan," says Bortnick, who runs the Web site, books the gigs and is a one-man PR juggernaut. "Ethan pushes himself." Ethan's story began three years ago with his favorite toy -- a pint-sized piano, plastic, with colorful, flashing lights. One afternoon, Ethan began mimicking a classical composition that was playing on the radio. Hannah Bortnick thought her son had hit the piano's demo button. "I was in shock," she recalled. "I never played the piano. My husband didn't, either. We knew we needed to get Ethan lessons right away." The lessons, however, would have to wait. Later that year, Ethan's mother gave birth to a little boy with a rare heart condition. She and Ethan's dad spent weeks at Miami Children's Hospital, waiting for baby Nathan to grow strong enough to go home. Ethan stayed with his grandparents. He used the time to teach himself dozens of songs on the toy piano, family members said. That's when he got serious about his lessons. "At first, his playing was very primitive," said Ludmila Vaserstein, Ethan's first piano teacher. "But I knew he was something special. He could feel the music." Vaserstein noticed something else: Ethan had perfect pitch -- the ability to identify musical notes without a reference. And within a few months, he was composing his own complicated pieces. Experts believe 3 percent to 5 percent of all children are gifted, likely due to genetic factors. But according to doctors, being gifted doesn't always predict future success. "Some prodigies do very well in life -- look at Mozart," said Dr. Jon A. Shaw, director of child and adolescent psychiatry at the University of Miami. "There are others, though, that lose it somewhere along the line. Personality development is a complex thing." Three years after discovering his talent, Ethan is practicing on the Samick grand piano his parents bought for him. He plays for an hour or two each day, his parents say. On this day, he begins with "Rondo Alla Turca," the final movement of Mozart's Piano Sonata No. 11, entirely from memory. "He's thinking about something," his dad says, noting that Ethan's eyes are closed. "You can tell. I just don't know what goes through his mind." Later, Ethan tries to explain: "My heart starts beating faster and faster. It's like, I'm getting really excited." After lunch, Ethan grabs a plastic dragon from his toy chest and bolts down the block to play with his cousins. "We have to prepare ourselves," says his father. "When he's 8, he could decide that he's done with the piano. We'd be OK with that. We'd have to be." There are plenty of distractions. Ethan is always asking to visit Parrot Jungle Island. He loves animals. Ethan's ambition in life: to own a zoo. (He'll play concerts for the animals, he says.) At Gulfstream Montessori, where Ethan attends kindergarten, the boy can be quiet around his classmates. He refuses to play sports, his dad says -- he worries too much about hurting his fingers. Still, Ethan's effect on the other children is clear. Gulfstream Montessori has had to hire an additional piano teacher to accommodate all the kids who want to take lessons, Ethan's dad says. Ethan himself plays charity events and private parties. His pay rate ranges between $400 and $5,000 per concert, according to www.gigmasters.com, an entertainment booking site. Aside from whatever Ethan earns, the Bortnicks live comfortably in an exclusive gated community along the border between Hallandale Beach, Fla., and Hollywood. Life has not been without its bumps. Nathan's heart condition has been a financial drain. And four years ago, Bortnick was indicted on charges of wire fraud, bankruptcy fraud and money laundering stemming from a $22 million business loan. Court documents say he was sentenced to seven days in custody and five years of supervised release. He was also ordered to pay $7.3 million in restitution and $1 million in punitive damages. Bortnick says he did nothing wrong and that, in any event, the episode has no bearing on Ethan or his aspirations. "His mother and I just want to help him realize his potential," Bortnick says. 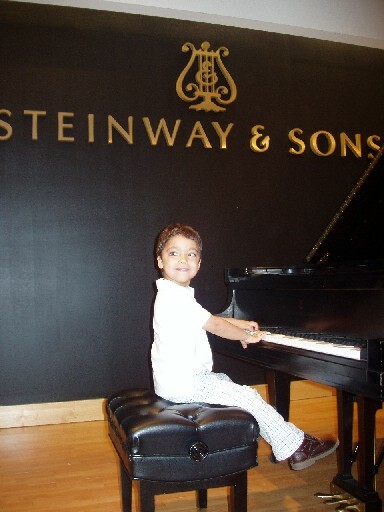 That night, Bortnick strolls around the Britto Gallery on Miami Beach's Lincoln Road as Ethan, decked out in a tiny tuxedo, plays a dozen compositions on a Steinway grand. The concert was not advertised, but Ethan draws a crowd. Dozens of tourists file into the gallery, some snapping photos of the boy on their cell phones. After the performance, Ethan shakes hands and signs autographs. "He's really something special," says his father.